Women with breast cancer fight one of life’s toughest battles. 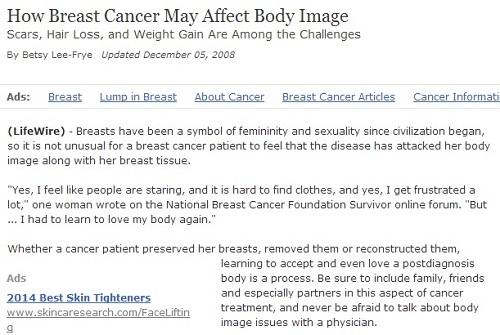 Often the solution they are left to accept is to lose one or both of their breasts through mastectomy. Although this can help stop the cancer, mastectomy can also leave a huge emotional scar on them. Breast reconstructions are also known to help mitigate the emotional impact of mastectomy. Many studies have pointed to the positive effects of reconstruction on a woman’s self-image, especially when done with realistic expectations to begin with. There are several options for breast reconstruction that a patient can choose from, including autologous reconstruction where tissue from elsewhere in the woman’s body is used to resculpt the breast; and prosthetic reconstruction where artificial implants—typically silicone-based–are used. Surgeons specializing in breast augmentation in Baltimore and elsewhere will recommend the procedure that will best conform to the patient’s conditions and preferences. In many cases, only one breast is removed and reconstructed, which could leave an unnatural appearance. To make the natural breast look like the reconstructed one as closely as possible, other procedures may be done. Baltimore patients can consider a breast augmentation, a reduction, or a breast lift in Baltimore for the natural breast. Through the emotional recovery process, it is important for cancer warriors to have the confidence in the professionals they work with. For breast reconstructions, they need to make sure they work only with qualified, board-certified plastic surgeons, like Dr. Jeffrey E. Schreiber of the Baltimore Plastic and Cosmetic Surgery Center. Knowing they are working with skilled, caring doctors can help patients in their road to recovery, enhancing their self-image in the process.